Nothing much happening today, nothing at work but walked in anyway as I needed to set a starting pace for my garmin. Once this one was in, I can upload it to do what they call "Virtual Partner". this means that after you've uploaded it to the watch, set off and activate the virtual partner and it constantly shows if you are in front or behind the previous walk, pushing you to improve every time. I have to do this as I'm not as lucky as most of you, out walking in pairs or groups, urging each other on. I walk mostly alone with my mp3 player (I'm learning a bit of conversational spanish at the moment, although most of it is falling straight through the memory banks!) Anyway, despite a few beers last night later on so feeling a little dehydrated, I set off just before nine weighed down with my laptop and some other gear in a rucksack so no racewalk, just brisk walking. Below are the results. I like the 1200 calories burned, and didn't realise it was a total climb of 239 metres, Snaefell is just over 600 metres. There are some steep hills on the way, which is why my Heart Rate approached 160 quite a few times. last year it was approaching 170 at the same points so this is an improvement. I think the best pace 7.03 minutes a mile was when I had to run across a road as a lorry was coming. 7 minutes a mile is World Record pace, something I'll never achieve! All this information is probably a little too much although I like the pretty maps, which you can also do in google earth style. After a cup of tea and an hours catch up I set off back, taking about five minutes longer. I could feel last nights guinness! That'll be it now until after next weekend, (Beer I mean, not training!) Walking in tomorrow as there are a few ship movements to sort out. 20 miles a day seem to be a good way of building up the stamina, especially this early in the training with over three months to go. Todays 10.2 miles at 5.3mph, over some tough hills, would be close to Parish speed of under 16 hours, so, especially as I was wearing jeans and carrying a rucksack over 15lb, very pleasing. Another month and it'll be shorts and no rucksack, and looking at knocking 10 minutes off the time. 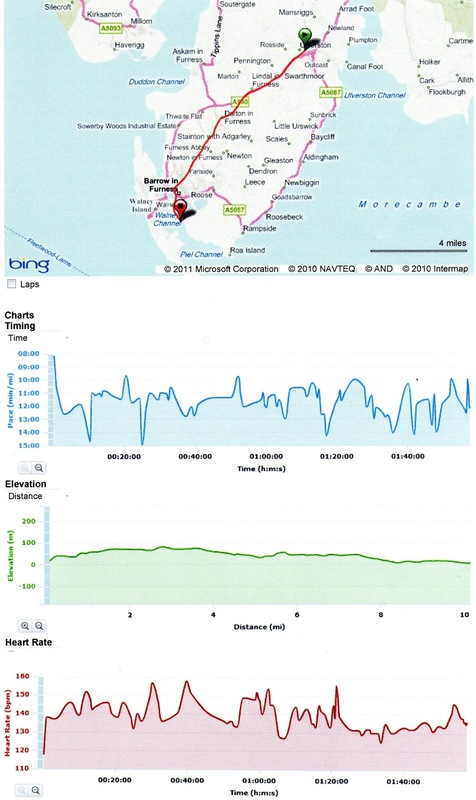 Also, Once into Barrow, (If you look at the map,) there is a return road about 5 miles longer but relatively flat along the south coast of Morecambe Bay, a round walk of over 25 miles and a chance to race walk the last 10 miles on the flat. I've lots of podcasts and audio books to listen to, so no problem there, so the next few weeks should see some improvement. I'm still hoping to get up a few mountains again, whilst we have all this low cloud it's a waste of time, and also plan to lap Coniston water and Windemere at some point, about 20 and 25 miles all round, although some stunning scenery to be seen on the way. Lots of things to see and do in the Spring and Summer. 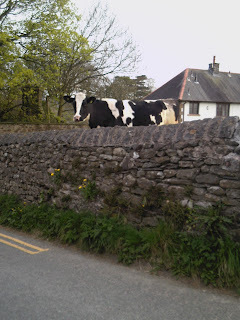 To finish off, a very tall cow, photographed just up the road from the very tall horse. they must breed them that way round here.